Great coffee starts with a seed. In order for that seed to become one of our superior quality coffee beans, it must be carefully cultivated by skilled and knowledgeable farmers throughout the growing, harvesting and milling process. Because of the labor-intensive process that is necessary on farms to bring coffee from seed to cup, farm workers are essential to the coffee industry. Therefore, we believe it is critical for successful coffee producers to put a premium on worker safety, welfare and compensation. As a company that began with farms in Costa Rica, we recognize and place high value on the critical role that farm employees play in delivering high quality coffee to consumers. It is a core value for us to be leaders in sustainable farming practices that provide quality of life on our farms and create thriving, sustainable communities surrounding our farms. In a seasonal industry such as coffee farming, hours are long and the work is strenuous. At Distant Lands Coffee’s farms and mills, we offer onsite housing, medical care and daycare services. 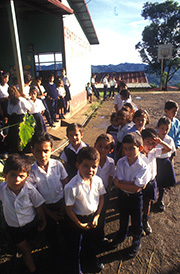 On several of our farms, we have schools for the children of our employees, and offer funding to pay for education. All of our full-time workers, and their families, are eligible to be enrolled in a preventative health-screening program, very important to the vitality of the workers and the crops. In addition to easy access to health and childcare services, we also provide on-site housing for our farm workers. By offering fair wages and working conditions, farms see less turnover. Many of the workers at our renowned Hacienda La Minita are second and third generation farmers. Again, this is a clear advantage in the production of coffee because long-time employees have acquired great knowledge and skill that can be leveraged to make the farming operations more efficient. When deciding which private label coffee-producing partner to work with, it is important to ensure that they follow best practices in sustainable farming and employee workplace safety, both critical to delivering quality and consistency year after year. There is no question that this is simply the best way to produce high quality coffee. The fact that we can produce coffees that are some of the finest in the market is proof that doing things the right way is the right way to do things. The entire industry can benefit from providing better health and welfare services to the agricultural workers that are the engine of the coffee industry.